Strategies For Renewal Options In Commercial Leases: CPI Or Fair Market? Covering the Basics in Fair Market Renewal Clauses, Basic and Second Generation Rent Setting Factors, A Basic Definition of Fair Market Rental, Expanding the Definition of Fair Market Rental to Benefit the Tenant, Features in the Suggested Pro-Landlord Fair Market Renewal Option The Mechanics of the CPI. 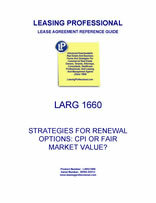 STRATEGIES FOR RENEWAL OPTIONS: CPI OR FAIR MARKET VALUE? The first generation of negotiated or fair market renewal clauses was fairly straightforward. Apart from the provisions in the clause pertaining to the mechanics of exercise and the other “normal” ingredients of an option clause, relatively simple language called for the minimum rental to be negotiated between the parties, usually prior to the commencement of the option period. Most clauses specified a period following the exercise of the option during which the rent would be agreed upon between the parties. Normally, if the parties could not agree upon the rent during that period, then the determination of rental would be referred to appraisers or arbitrators. Clauses varied as to whether the tenant would be allowed to withdraw its exercise if the tenant thought the option rental was too high, but usually the tenant was locked in following its exercise, no matter what the rent for the option ultimately turned out to be. Some clauses, especially those negotiated by tenants with good leverage, called for the option rent to be agreed upon or determined prior to the tenant's exercise. That approach gave the tenant the luxury of knowing the renewal rental in advance. If the option rental was too high, the tenant could go elsewhere, usually with plenty of time to negotiate a lease for substitute space. Early negotiations between landlords and tenants focused heavily upon the arbitration or appraisal mechanics in the option clauses. Obviously, it was important to have the rent setting process move along quickly, so that the option rent could be determined before the option term actually started. Likewise, it was important to have appraisers or arbitrators that were qualified and experienced with commercial leasing. Appraisers were often required to have MAI designations, or other qualifications. Many clauses contained prohibitions against the use of appraisers with existing business relationships with one of the parties, or had other restrictions concerning bias. Is “fair market rental” defined as the annual amount per square foot that a “willing, comparable, new tenant” would pay and that a “willing, comparable landlord” would accept on an arm's length basis? Does the language expressly refer to the specific type of office building under consideration (e.g., a first class suburban office building)? Does the definition specifically consider annual rental per rentable square foot? What about whether or not brokerage commissions are payable for comparable new leases or for the renewal? Is the cost of making tenant improvements for new leases in comparable buildings (i.e., work letter contributions by landlords) considered in formulating fair market rental? The second generation of fair market rental option clauses (i.e., those drafted by professionals after years of experience with fair market rental options) focused increasingly upon the precise factors that could be considered by the appraisers in their determination of fair market rental for the premises. Landlords and tenants were becoming experienced with fair market renewals, and they realized that the precise factors considered by the appraisers had a substantial impact on the ultimate rental figure for the option. Is the credit strength of the current or new tenant considered? If the option pertains to retail space, is the business reputation and operational expertise (e.g., marketing strength) of the tenant considered? Is the quality of the existing leasehold improvements taken into account? Is the quality of the building itself considered? Is the level of services in the building a factor? Are adjacent parking facilities or other amenities in the office complex considered (even though they are not part of the premises)? Should the fair market rental be determined based upon the assumption that the premises are vacant? Are takeover and assumption costs (e.g., landlord assumption of the lease payments relating to the space formerly occupied by a tenant, moving costs, stationery expense, etc.) that the landlord would have to bear for a new tenant considered? Is the amount of the expense stop and direct expense reimbursement payable by the tenant considered in determining market rentals? Are the duration and extent of rental abatements for new leases in comparable buildings in the same submarket considered? Are periods of free rent during the construction of leasehold improvements for tenants under new leases considered? Is the size of the premises and its location within the building (e.g., top floor locations) considered in setting the market rental? Many of the factors listed above pertain to what is “comparable” when the renewal space is compared to space currently being leased in the market. These factors must be included in a tightly drafted definition of “fair market rental” (e.g., “...the annual amount per square foot that a willing, comparable, new tenant would pay and that a willing, comparable landlord would accept, on an arm's length basis...”) to avoid later disputes between the landlord and the tenant over the rent setting process. Both the pro-landlord and the pro-tenant clauses that follow contain carefully drafted definitions of fair market rental, and stipulate the precise factors that appraisers can or must consider in setting the renewal rent. It is common for renewal options which fix the rent at fair market rental to include some method to determine the rent if the parties cannot agree upon what constitutes fair market rental for the premises. Generally, the issue is settled by the landlord and the tenant each appointing an appraiser or arbitrator to determine fair market rental. Frequently, if the two appraisers cannot agree, or cannot agree within a certain percentage amount, a third appraiser will be appointed and the findings of the appraisers will be combined or averaged to determine fair market rental.